John Brown with Donna Brown’s “Why Not? 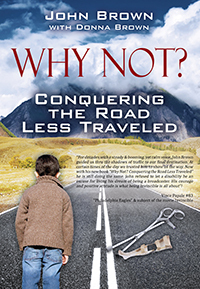 Conquering The Road Less Traveled.” John Brown was determined that he would leave his mark on the world. He and his strong willed mother fought against the times’ conventional wisdom and doctors’ predictions that he would never walk because of his Cerebral Palsy. This is a story of the American spirit, how tears, determination and true grit can get you to the top…as an award winning radio disc jockey.